NetDocuments advances global data governance solutions by deploying advanced encryption key management technology across its native cloud platform, including optional client-key custody services for complete silent-subpoena defense and multi-layered data protection. This degree of security and encryption at the storage, application, and processing layers, ... solves the long-standing issues of data privacy and key custody relating to silent-subpoenas and encryption key management. 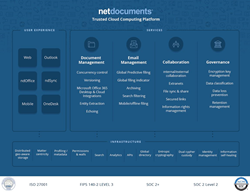 NetDocuments, the leading cloud-based document and email management (DMS) platform for law firms and corporate legal departments, today announced it has successfully deployed multi-layer encryption key management (EKM) technology including optional private and customer-held encryption keys as part of its comprehensive data governance offering. Details will be presented during ILTACON 2017 in Las Vegas, NV on August 13 – 17. Join us at ILTACON on Tuesday, August 15 at 4:00 pm in the Oceanside F conference room as Alvin Tedjamulia discusses how NetDocuments’ cloud platform is delivering solutions for encryption key management, Data Loss Prevention (DLP), Digital Rights Management (DRM), and other information governance challenges and opportunities facing today’s leading law firms and corporate legal departments. Founded in 1999, NetDocuments’ cloud-based service allows firms of all sizes to reduce costs and increase security, mobility, compliance, and disaster recovery for documents and email from anywhere and on any device. With offices and datacenters in the US, Australia, and the UK, and with over 2,000+ customers and hundreds of thousands of users, NetDocuments is able to effectively service its global community spread across 140 countries. With anytime, anywhere access, firms are able to increase productivity and improve the client experience through a comprehensive cloud-based service. For more information about NetDocuments, please visit http://www.netdocuments.com.